Nathan's Real Estate Notions: Let the Selling Season Begin! The Superbowl was a monumental moment for the Saint’s franchise. It was the first time in their history that they brought home the trophy. Luckily for us, our future in real estate is much more predictable. The middle of February is always the time when more homes begin to come on the market and deals can be made. We have already seen huge surges in home purchasing. The chart at the bottom illustrates that the time on market has dropped by close to 20 days in some markets! Real Estate Nationally on the Rise??? 78 Days Left! : April 30, 2010 is the deadline for the $8,000 First Time Home Buyer, and now $6,500 REPEAT homebuyer Federal Tax Credit. Click here for a video explaining how the credit works, and you can visit the website http://www.federalhousingtaxcredit.com/ to read the frequently asked questions about the credit. 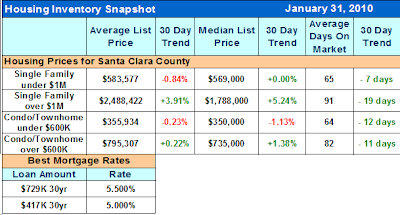 The chart below shows that cities east of highway 880 are continuing to have less inventory. Home prices have risen in these areas as much as 10% in 6 months. Demand has far outweighed supply. For Comparison: The West side of Highway 880 is slowly picking up steam and following suit. If the graph below does not appear, click here to view it. The buying season is upon us. The extension of the tax credit will continue to spur activity as well as low interest rates. Prices across the bay area will continue to rise. Enjoy the rest of your week and as always I welcome referrals from friends, co-workers or family members looking to buy a piece of property. I am also happy to provide unbiased sound advice at any time. You can rely on my integrity and follow-through.
" Mistakes are the portals of discovery. "